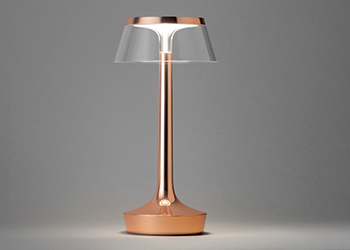 A lamp from the Bon Jour collection. Italian lighting firm Flos has launched the Bon Jour family of lamps. Designed by Philippe Starck, the lamps introduce a new archetype – a body that is ethereal, pure and almost immaterial. Its transparent base can be customised according to personal tastes and styles by ‘dressing’ it with a chrome, copper or matt white metallic plastic hat that incorporates the LED (light-emitting diode) light source, according to a spokesperson for Flos. Shades are available in multiple finishing and materials – amber-coloured injection-moulded plastic, or transparent yellow in a more contemporary high-tech style, or classic pleated fabric, or natural raffia. The range comprises Bon Jour T and Bon Jour Unplugged. “The first model is the table version of Bon Jour bringing elegance and personality to the home ambience, thanks to the purity of its shape and the variety of its finishes,” says the spokesperson. Bon Jour Unplugged is the smaller table model of the series and hosts on its base a micro-USB connector to recharge its battery in 30 minutes, for a lighting life of six hours. The Decem sliding door with finger pull handle. 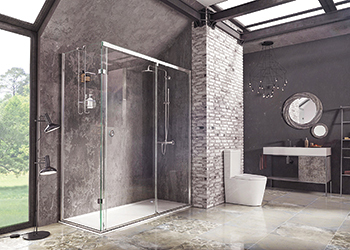 Leading international shower designer and manufacturer Roman has added a new and revolutionary sliding door to its 10-mm Decem Collection. The British firm has a completely new and innovative sliding system, which results in a solid, smooth and almost silent action, according to David Osborne, managing director of Roman. Elaborating on the product, he says: “It has a new soft close system at each end that is machined to create a drop before the door hits the piston, which improves the action of the opening and closing itself. This enclosure is particularly straight-forward to install as the fixing system is external, whereas it would usually be internal. This sliding door also features a unique finger pull handle, which is framed with silver chromed brass, creating a contemporary design. To ensure reliable water integrity of the enclosure, it has an incorporated dam system. An object of extraordinary craftsmanship, the LessThanFive Chair designed by the Coalesse Design Group and Michael Young is handcrafted from carbon fibre and supports a variety of users while weighing less than 2 kg. Made entirely from moulded and heated layers of carbon fibre, the LessThanFive Chair’s manufacturing process includes astute handwork to assemble and finish each tooled component, from the digital design through to the final product. A visualisation tool for LessThanFive engages customers via an online web-based platform, allowing complete customisation and personalisation over the chair’s colour design with a few easy clicks of a screen. 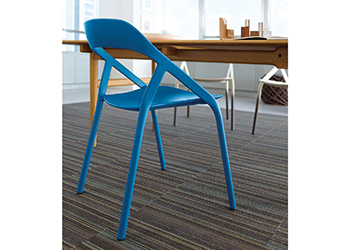 Customers are able to import any colour combination and configure any pattern on to the pre-defined areas of the chair. Launched after two years of development, the LessThanFive chair is the first product Coalesse has made from carbon fibre. It can be easily moved and stacked up to four pieces high for convenient storage purposes. Manufactured as a single piece and thereby removing the need for joints and fixings, the sheets of carbon fibre are woven together and then layered in a heated mould, before being polished by hand.